Besøg Trujillos mest betydningsfulde arkæologiske sted på en kulturel helgedagstur i områdets mest atmosfæriske og forbløffende ruiner. Udforsk de hellige strukturer i Moches templer; fest på lokale specialiteter i kystbyen Huanchaco; og opdag Sydamerika største by på UNESCOs verdensarvssted Chan Chan. Ledsaget af en vidende guide, berige din historiske viden om regionen på denne spændende arkæologiske udflugt. Efter hotel afhentning i Trujillo, slappe af under den korte køretur til din første destination i en aircondition minivan. Ankomme på det gamle område af Solens Tempel og Månens Tempel, kollektivt kendt som Moches Templer, og sat op for at opdage den fascinerende fortid af strukturerne. Lær om den præcise arkitektur og usandsynlige byggematerialer, der anvendes; beundre de indviklede friser som dekorere væggene; og få indsigt i de ceremonielle funktioner i de kolossale bygninger. Dernæst vove sig til den frygtelige Drage-Tempel for at fordybe dig i Chimu-civilisens fængslende skikke; beundre pyramiden detaljerede skildringer af guddommelighed før du vender tilbage til minivan for at rejse til næste websted. Tag en kuperet kystvejen til provinsbyen Huanchaco, en fiskeri pueblo berømt for sin idylliske beliggenhed ved havet og traditionelle fiskerbåde. Lær om den kulturelle betydning af disse unikke søfartøjer, så fest med hjemmelavede regionale specialiteter i en autentisk restaurant. Prøve sublime fisk og skaldyr og nyd forfriskende drikkevarer under dit måltid. Revitalized, leder til det enorme arkæologiske websted Chan Chan, erklærede den største antikke by i Sydamerika. Som det tidligere centrum af Chimu politik og handel, kan 7-kvadratkilometeret (18 sq km) prale af helligdomme, kirkegårde, ceremonielle pladser og reservoirer. Tour alle de vigtige funktioner med din guide, opdage arkitektonisk præcision og dybere dybere ind i sin gamle historie. Fordel din nyfundne viden under for at vende tilbage til dit Trujillo hotel, hvor din tur afsluttes. The guide was punctual, enthusiastic, well-informed and her English was excellent. The various sites were amazing, and a very interesting contrast to the better-known Inca ruins. Do not do this combined tour! A waste of your money! This was a very expensive package and we do not feel that we got our moneys worth. The morning started with a visit to a local vendor to quickly learn how pottery is made and then we were taken to his onsite gift shop before leaving the property. When we arrived our guide had to bang the gate several times while shouting his name to get his attention we think he was still asleep when we arrived. Considering we spent the day visiting ruins made with clay bricks it would have been more interesting to watch the other vendor that we noticed at the back of the same property actually making clay bricks as opposed to the vendor telling us how pottery is made. Definitely seeing Temple of the Moon and Sun which you do not actually visit and Chan Chan were hi-lights. The description for the standalone tour to the temples indicates that both temples will be visited, but when everything is combined as the Archeological Tour we only got to visit the Temple of the Moon and then view the Temple of the Sun from a distance. Temple of the Dragon was a disappointment as we were only there for 10 minutes and then left. Not much to see as part of it is closed due to the rains earlier in the year and there was a lot of driving required to get to this site. Lunch in Huanchaco was excellent! However, the tour guide provided us with a customer satisfaction survey at lunch and then watched as we completed it and then read it as we sat there. Very uncomfortable and we were not given an opportunity to provide our honest feedback. We saw the beach and were shown the reed boats quickly with little to no explanation as to their history/historical importance. Very basic information provided at most of the sites including the museum we could have read the same information ourselves. Not a lot of value added information provided by the guide. This tour was fabulous! 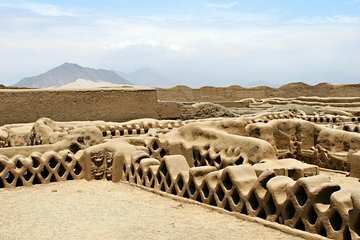 We added Trujillo to our travel plans because we'd read about Chan Chan and wanted to include it in our list of ruins, but this tour added some other ruins that were truly spectacular. The temple of the moon is really something, you can see original painting on the parts of the temple walls that have been exposed and it's just incredible. Our guide was great, he took us around the museums and explained a lot more about the artifacts than was available in the Cusco museums. He took photos for us the restaurant we went to for lunch was much better than we expected. Henry made recommendations for items on the menu that were quite tasty. This tour is worth adding to a trip to Peru. You gave us a lousy guide who merely repeated the information we could read at the site by ourselves. This was a very expensive taxi ride!